A cell biology study adds evidence that sensory neurons, not just motoneurons, take a direct hit in amyotrophic lateral sclerosis (ALS). Scientists led by Gregorio Valdez, Virginia Tech Carilion Research Institute, Roanoke, report that sensory neurons cultured from mice overexpressing one of two mutant human genes that cause familial ALS have shorter neurites that grow more slowly than those from control mice. These neurons produce altered levels of stress-response genes, according to data published November 8 in Scientific Reports. That sensory neurons show pathology in culture suggests their problems are caused by the mutations themselves, and don’t arise as a secondary result of ALS pathology. These cultures could provide a way to study disease mechanisms and screen for ALS treatments, Valdez told Alzforum. “What’s interesting in this paper is that the authors investigated cellular changes, which are difficult to investigate in humans,” said Pierre-François Pradat, Hôpitaux de Paris. Mounting evidence from biopsy, sensory nerve conduction, and magnetic resonance imaging studies have suggested trouble for sensory neurons—especially in people who carry ALS-causing SOD1 variants. These neurons atrophy, lose myelin, and function poorly alongside their fellow motoneurons (Pughdal et al., 2007; Heads et al., 1991; Pradat and El Mendini, 2014). Supporting these data have been studies from Valdez and others reporting axonal degeneration in sensory neurons of SOD1G93A and TDP-43A315T mouse models of ALS (Sassone et al., 2016; Guo et al., 2009; Sábado et al., 2014; Vaughan et al., 2015). But are the ALS-causing mutations directly affecting these sensory neurons, or are the neurons suffering secondary effects of the disease? To find out, first author Sydney Vaughan isolated sensory neurons from the dorsal root ganglia of SOD1G93A and TDP-43A315T mice, as well as from wild-type controls. Compared with controls, neurons from the transgenic mice had shorter, less-branched neurites. Over a period of six days in culture, their neurites grew more slowly and branched less. 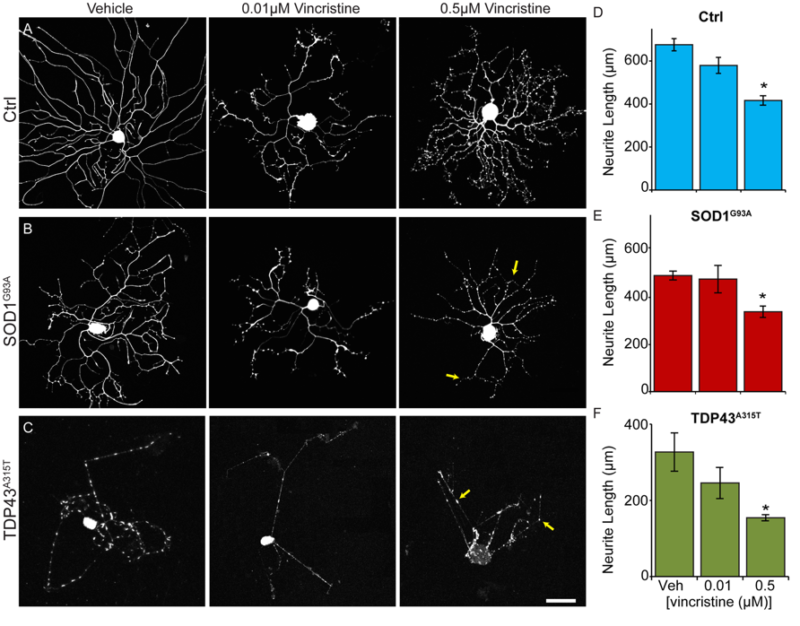 The neurons were more sensitive to vincristine, a drug that destabilizes microtubules and causes neurite degeneration. Did the expression of repair genes change in the neurons? In whole dorsal root ganglia from both transgenic mouse models, which contain numerous cell types, the researchers found heightened levels of stress-response proteins called activating transcription factor-3 (ATF-3) and protein kinase RNA-like endoplasmic reticulum kinase (PERK) (see May 2017 news). However, isolated sensory neurons from the TDP-43A315T mice exhibited lower levels of these two stress-response genes than sensory neurons from wild-type controls. This suggests that in TDP-43 A315T mice, sensory neurons depend on other cell types for help with these stress-response mechanisms. Future ALS therapies will need to target sensory as well as motor neurons, said Valdez. Importantly, he believes, sensory neuron cultures could help explore disease mechanisms and therapeutic opportunities in ALS. This is relevant given that much work still needs to be done to derive from patient iPSCs mature motor neurons exhibiting ALS-related pathology that can survive in a culture dish for weeks (Sances et al., 2016). Valdez plans to test all known ALS-causing mutations to see how they affect cultured sensory neurons. Confirming involvement of sensory neurons in ALS evokes spinal muscular atrophy. Also typically considered a motoneuron disease, SMA was shown to affect the sensory system, as well (Fletcher et al., 2017). “This reinforces that we have to understand motor neuron diseases as more complex than we thought before, in that they affect a wider populations of cells,” Pradat wrote, noting that these findings should be confirmed in cultured sensory neurons derived from patient iPSCs. Vaughan SK, Sutherland NM, Zhang S, Hatzipetros T, Vieira F, Valdez G. The ALS-inducing factors, TDP43A315T and SOD1G93A , directly affect and sensitize sensory neurons to stress. Sci Rep. 2018 Nov 8;8(1):16582. PubMed. Pugdahl K, Fuglsang-Frederiksen A, de Carvalho M, Johnsen B, Fawcett PR, Labarre-Vila A, Liguori R, Nix WA, Schofield IS. Generalised sensory system abnormalities in amyotrophic lateral sclerosis: a European multicentre study. J Neurol Neurosurg Psychiatry. 2007 Jul;78(7):746-9. PubMed. Heads T, Pollock M, Robertson A, Sutherland WH, Allpress S. Sensory nerve pathology in amyotrophic lateral sclerosis. Acta Neuropathol. 1991;82(4):316-20. PubMed. Pradat PF, El Mendili MM. Neuroimaging to investigate multisystem involvement and provide biomarkers in amyotrophic lateral sclerosis. Biomed Res Int. 2014;2014:467560. Epub 2014 Apr 17 PubMed. Sassone J, Taiana M, Lombardi R, Porretta-Serapiglia C, Freschi M, Bonanno S, Marcuzzo S, Caravello F, Bendotti C, Lauria G. ALS mouse model SOD1G93A displays early pathology of sensory small fibers associated to accumulation of a neurotoxic splice variant of peripherin. Hum Mol Genet. 2016 Apr 15;25(8):1588-99. Epub 2016 Feb 9 PubMed. Guo YS, Wu DX, Wu HR, Wu SY, Yang C, Li B, Bu H, Zhang YS, Li CY. 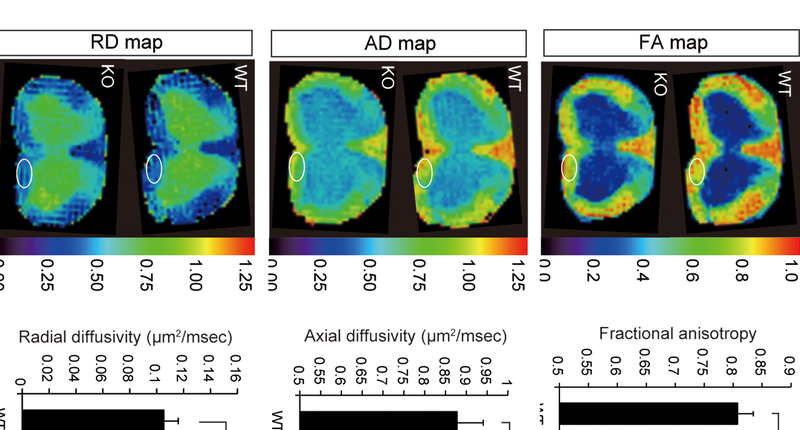 Sensory involvement in the SOD1-G93A mouse model of amyotrophic lateral sclerosis. Exp Mol Med. 2009 Mar 31;41(3):140-50. PubMed. Sábado J, Casanovas A, Tarabal O, Hereu M, Piedrafita L, Calderó J, Esquerda JE. Accumulation of misfolded SOD1 in dorsal root ganglion degenerating proprioceptive sensory neurons of transgenic mice with amyotrophic lateral sclerosis. Biomed Res Int. 2014;2014:852163. Epub 2014 Apr 27 PubMed. Vaughan SK, Kemp Z, Hatzipetros T, Vieira F, Valdez G. Degeneration of proprioceptive sensory nerve endings in mice harboring amyotrophic lateral sclerosis-causing mutations. J Comp Neurol. 2015 Dec 1;523(17):2477-94. Epub 2015 Jul 21 PubMed. Sances S, Bruijn LI, Chandran S, Eggan K, Ho R, Klim JR, Livesey MR, Lowry E, Macklis JD, Rushton D, Sadegh C, Sareen D, Wichterle H, Zhang SC, Svendsen CN. Modeling ALS with motor neurons derived from human induced pluripotent stem cells. Nat Neurosci. 2016 Apr;19(4):542-53. PubMed. Fletcher EV, Simon CM, Pagiazitis JG, Chalif JI, Vukojicic A, Drobac E, Wang X, Mentis GZ. Reduced sensory synaptic excitation impairs motor neuron function via Kv2.1 in spinal muscular atrophy. Nat Neurosci. 2017 Jul;20(7):905-916. Epub 2017 May 15 PubMed. Vucic S. Sensory and autonomic nervous system dysfunction in amyotrophic lateral sclerosis. Neuropathol Appl Neurobiol. 2017 Feb;43(2):99-101. PubMed.